Becoming a better thinker means understanding the way you think and developing a way of approaching problems that allows you to see things from multiple lenses. These lenses, or mental models, are built on the foundations of physics, biology, math, psychology, as well as history and economics. The more tools you have in your mental toolbox the better able you will be to make an incrementally better decision. These tools also allow you to better understand when to follow and when to reject conventional wisdom. Ideally you want to go through them checklist style — just run right through them — asking what applies. John Snow was a doctor based in London during the acute cholera outbreak of the summer of 1854. He represents a powerful example of the impact a lollapalooza effect can have. A lollapalooza is when several ideas combine to produce an unusually powerful result. Snow developed systems to ease the pain of surgery with ether and chloroform. Snow was a truly consilient thinker, in the sense of the term as it was originally formulated by the Cambridge philosopher William Whewell in the 1840s (and recently popularized by Harvard biologist E. O. Wilson). “The Consilience of Inductions,” Whewell wrote, “takes place when an Induction, obtained from one class of facts, coincides with an Induction obtained from another different class. This Consilience is a test of the truth of the Theory in which it occurs.” Snow’s work was constantly building bridges between different disciplines, some which barely existed as functional sciences in his day, using data on one scale of investigation to make predictions about behavior on other scales. In studying ether and chloroform, he had moved from the molecular properties of the gas itself, to its circulation of those properties throughout the body’s overall system, to the psychological effects produced by these biological changes. He even ventured beyond the natural world into the design of technology that would best reflect our understanding of the anesthetics. Snow was not interested in individual, isolated phenomena; he was interested in chains and networks in the movement from scale to scale. His mind tripped happily from molecules to cells to brains to machines, and it was precisely that consilient study that helped Snow uncover so much about this nascent field in such a shockingly short amount of time. Suspending belief in the common theory at the time on how diseases were spread, Snow ended up rejecting miasma theory, which said the disease was spread via “bad air.” He did this through science. He conducted interviews with residents and traced the majority of cases back to a single water source. His willingness to challenge conventional thinking, along with approaching the problem through multiple lenses, resulted in finding the deadly source and changes in municipal water systems from that day forward. Charlie Munger is a strong advocate of a mental framework. In Damn Right: Behind the Scenes with Berkshire Hathaway Billionaire Charlie Munger, he offered five-simple notions that help solve complex problems. In The Focused Few: Taking a Multidisciplinary Approach to Focus Investing, Richard Rockwood explores the concepts from many disciplines. Adding them together can yield a useful mental checklist. Inverting, or thinking problems through backward, is a great way to understand information. Charlie Munger provides the best illustration I have ever seen of this type of thinking. During a speech he offered an example of how a situation could be examined using the inversion process. He discussed the development process of Coca-Cola from the perspective of a person creating a soda company from scratch and examining the key issues that would need to be resolved to make it a reality. What kind of properties should the new drink strive for, and what are those it should avoid? One property the drink should not have is an aftertaste. Consumers should be able to consume large quantities over a period of time and not be deterred by an unpleasant aftertaste. The soda should be developed in such a manner that it can be shipped in large quantities at minimal costs. This makes it easier to develop an efficient, large-scale distribution system. Keeping the soda formulation a secret will help alleviate competition and create a certain aura of mystique around the product. The company also can deter competition by expanding the business as quickly as possible. For example, the distribution system could be expanded until it reaches a critical mass that competitors would find hard to duplicate without massive capital expenditures. The danger is that you may think you understand a particular situation when in fact you have only developed a likely story. Second-level thinkers, in contrast, approach decisions differently. What kinds of questions should a second-level thinker ask? In his book, The Most Important Thing: Uncommon Sense for the Thoughtful Investor, Howard Marks provides a useful list of questions to ask. What is the probability that I’m right? What is the prevailing consensus? How does the current price for the asset comport with the consensus view of the future— and with mine? Is the consensus psychology that is incorporated into the price too bullish or bearish? 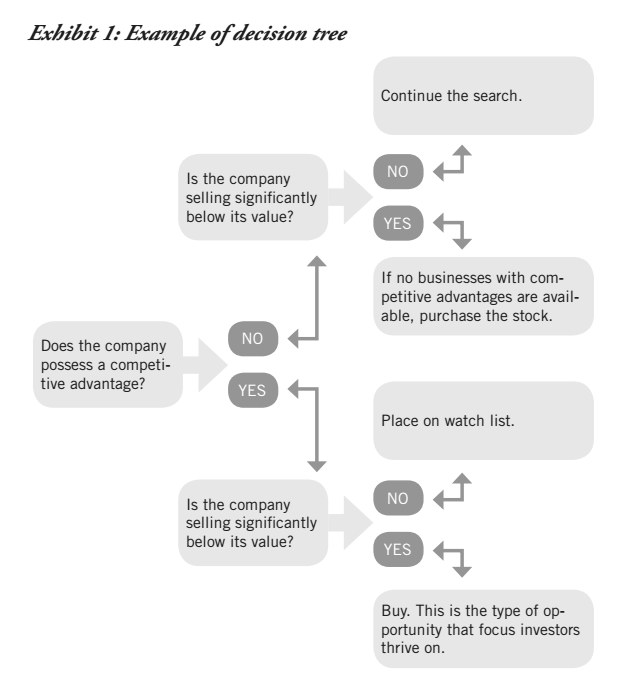 Decision trees are excellent tools for helping you decide on a course of action. They enable you to lay out several possible scenarios, investigate their possible outcomes, and create a balanced picture of the risks and rewards associated with each. Let’s examine the decision-tree process in greater detail. First, identify the decision and the outcome alternatives available at each point. After you lay out each course of action, determine which option has the greatest value to you. Start by assigning a cash value to each possible outcome (i.e., what the expected value would be if that particular outcome were to occur). Next, look at each break, or point of uncertainty, in the tree and estimate the probability of each outcome occurring. If you use percentages, the combined total must equal 100% at each break point. If you use fractions, these must add up to 1. After these two steps have been taken (i.e., the values of the outcomes have been entered and the probabilities have been estimated), it is time to begin calculating the expected values of the various branches in the decision tree. When trying to resolve a difficult situation or determining exactly why a product has been, and may continue to be, successful, it helps to think about the problem by creating a checklist that incorporates the vital components of other disciplines. The Focused Few goes on to explore more of the elements of multidisciplinary thinking.